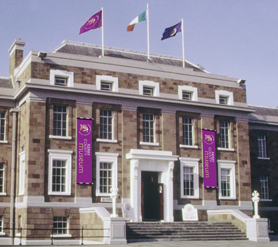 Kerry County Museum was developed as an initiative of Tralee Urban District Council in two phases between 1991 and 1992. The Medieval Experience was opened in 1991 in the lower ground floor of the Ashe Memorial Hall, taking visitors through the recreated medieval town, with the sights, sounds and smells. In 1992 the main gallery of the Museum was opened, displaying the archaeology and history of the county. Thereafter, a temporary exhibition space was added, allowing for the development of major exhibitions. Today, the whole facility comprises 1,750 square metres, which includes the exhibition galleries, reception, collections store, and education room. The Museum collects, records, preserves, displays, and communicates material relating to the archaeological, historical and cultural heritage of County Kerry. It is a designated repository under the National Monuments Act and has a strong and varied collection of approximately 4,000 objects. KCM was awarded Full Accreditation from the Heritage Council’s Museum Standards Programme for Ireland in 2013. Our staff members include those with professional qualifications and expertise in archaeology, history and education, as well as extensive experience of visitor services. We have an education and outreach service that extends from September to June and involves both Kerry and Munster schools. Our audience base is comprised of national and international visitors as well as the local community. We have a number of well-developed marketing channels and we actively contribute to a number of marketing networks, both locally and nationally. One of the most attractive buildings in Tralee, the Ashe Hall sits at one end of Denny Street surrounded on three sides by the town park. Thomas Ashe, a young teacher from Kinard, Lispole, led the Fingal Battalion during the Easter Rising and scored a major victory in Ashbourne, Co Meath when his group of 60-70 men engaged a much larger force. Captured and imprisoned after the rebellion, he was subsequently released under an amnesty in 1917. Two months later he was rearrested and sentenced to two years’ hard labour for sedition. Ashe demanded prisoner-of-war status and went on hunger strike on September 20. Five days later he died after being force-fed by Mountjoy Prison authorities.